Blue leather upholstery throughout gives a warm, classy feel to this boat. The cabin carpeting was recently renewed. VHF DSC, handheld VHF and Raymarine Dragonfly chart plotter, depth sounder and fish finder. Comes with brand new 8 man liferaft. This is an ideal low cost pied a terre in Gibraltar. Hedge your bets as Brexit approaches. The On the day we visited the boat (08/06/2017) to take the photos she had just returned from her annual maintenance cycle. She has just been anti-fouled, had her anodes replaced and had her hull polished. She is in sparkling condition and ready for a full summer season of fun. The vendor told us that since he acquired the boat he has spent £40,000 (£11,000 in the last month) on her including the replacement of the two outdrives. Service records are available for inspection. 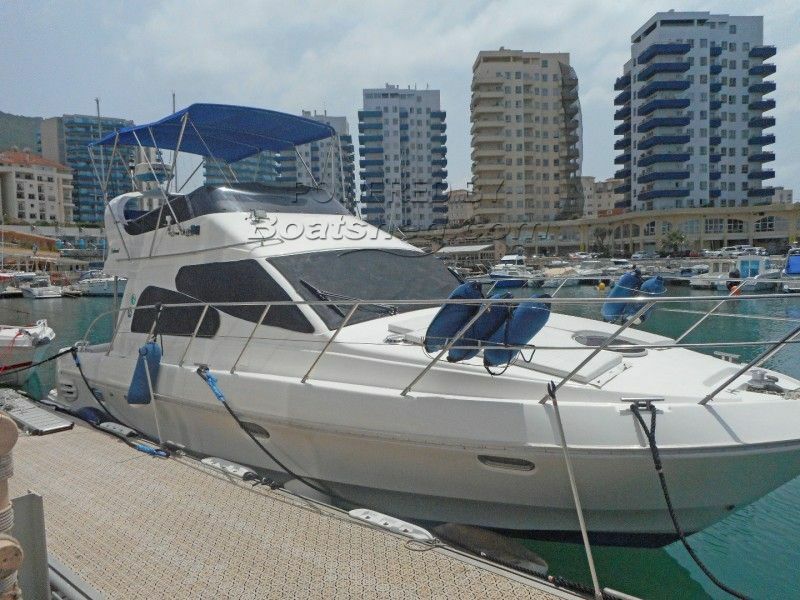 This is a lovely boat, in great condition and at under 12m will be economical on marina berthing fees. An early viewing is strongly recommended as this is one of the most keenly priced Birchwood 360 Challengers on the market today. This Birchwood 360 Challenger Fly Bridge Cruiser has been personally photographed and viewed by John & Lynda of Boatshed Gibraltar. Click here for contact details.